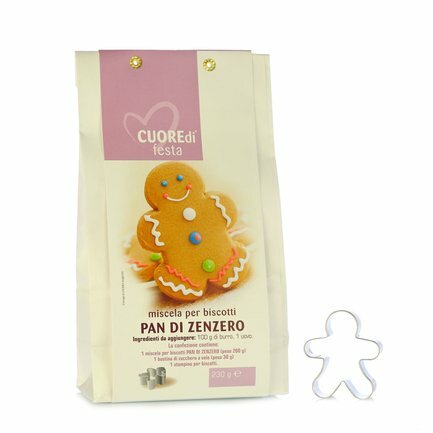 The Pan di Zenzero biscuits are loved by big and small, but are even better when made at home. 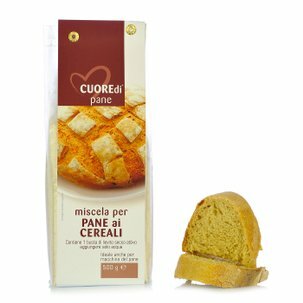 For this reason, Cuore Di has prepared this mix, to which you only need to add an egg and a bit of butter in order to make exquisite biscuits to be enjoyed in good company. The package also contains a packet of powdered sugar that you can use to decorate the biscuits, letting your fantasy guide you, and a mould that makes it easy to make biscuits that are perfect and....delicious. Ingredients “00” type soft wheat flour sugar, spices: ginger (2% total), cinnamon, nutmeg, cloves, salt, raising agent: bicarbonate of soda. Icing sugar sachet ingredients (30 g): icing sugar, wheat starch, flavouring: vanilla essence. ALLERGENS: CEREALS CONTAINING G For more information on product labels, please contact our Customer Service department. The information on the labels of the products may vary for reasons beyond our control, therefore, there may be discrepancies between the information on the site and that on the products delivered. Please always check the information on the product before consumption or use. 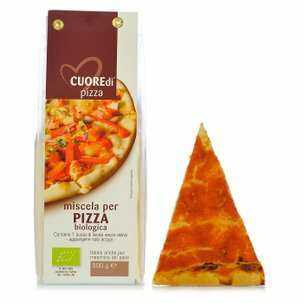 A product line that should never be missing from your pantry: Cuore di allows you to serve a range of delicious desserts with specially formulated mixes and the addition of a handful of ingredients. You'll be able to amaze your friends with gorgeous sweets, cakes and tarts or bake deliciously fragrant biscuits for the family breakfast effortlessly and merrily... with guaranteed success.